Azores : When and where to go? In the Azores there is a temperate climate with oceanic influence, with temperatures around 14 ° C in winter and 25 ° C in summer. The weather is pleasant in all seasons and the sky is often clear. However, frequent rains may occur between November and February. The most favorable period to discover the archipelago is between April and October, although the months of July and August are sometimes spoiled by a few rains. Ponte Delgada is the capital, and is located on Sào Miguel, the largest island of the archipelago. You will visit churches and museums, admire the baroque style manor of Santa Catarina, stroll through the oldest streets in the center, stop in the gardens. The Lake of Fire is located in the crater of one of the three volcanoes of the Azores, which has been filled by rain water, and sometimes fumaroles in jets escape (attention to the burns): at the top you will have a Superb view on the island of São Miguel. The waterfall of Caldeira Velha joins the Lake of Fire, where you can bathe, the site forming a warm natural pool, with, under the cascade, a secret niche. Wonderful site! The island of Villa Franca, classified as a nature reserve, and protected, will fill the divers with its extraordinary aquatic fauna, provided you respect the rule that limits access to a certain number. The Cathedral of Terceira is also the largest church in the Azores. Built in the 16th century, it overlooks Angra do Heroismo and its pretty fishing port, and you can admire inside the front of the altar in silver, made in the 17th by local artisans. The Tomb of the Elephants is a natural sculpture in the cliffs, which represents three elephant heads with their visible horns, located by the sea on the island of Sao Miguel: an astonishing place. On the island of Faial, besides the blue hydrangeas which make it famous, you can admire in Horta, its capital, the walls painted with drawings depicting the beautiful boats that have stopped in the port, but also to discover the Caldera with its crater Enormous and, at its summit, a stunning panorama. On Pico, the terraced vines are cultivated on the flanks of the volcano, and the Museum of the Whaling Industry is visited in Vila de Sào Roque, which testifies to the history of the whalers and the local harpoons. Outdoor activities: you can practice many sports in idyllic settings, horseback riding, cycling, scuba diving, sailing, unless you prefer hiking or whale watching. Nature occupies a prominent place in the Azores and you can enjoy as much as you want. The beaches on the other hand are quite rare and their sand and black, which can confuse the bathers, especially since the water is fresh even in summer. Europeans can enter the Azores with a piece of identification, and a visa is only required for a stay of more than 3 months. To reach the Azores, you can take a plane from several French airports and land in Lisbon then Ponta Delgada or Terceira. Between the islands of the archipelago there are ferry or boat connections. To get around the islands, it is best to rent a car: there are indeed few buses, and taxis are quite expensive. Budget: the budget is fairly reasonable. One can be accommodated in a double room for about 70 €, eat a dish of the day for a fortnight, and a sandwich for less than 2 €. 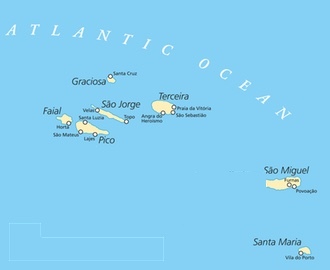 Safety: the Azores are a safe destination, there are no special precautions to take. Shopping: you can bring cheeses, honey, or pastries, if you are greedy, but also local wine, fruit-based eaux-de-vie (pineapple and passion fruit) and tea. If you prefer crafts, you will have the choice between ceramic or basketry items, embroidered fabrics, lace, fans or sculpted volcanic stones.